Will Macron's U-turn stop France's 'yellow vest' protests? 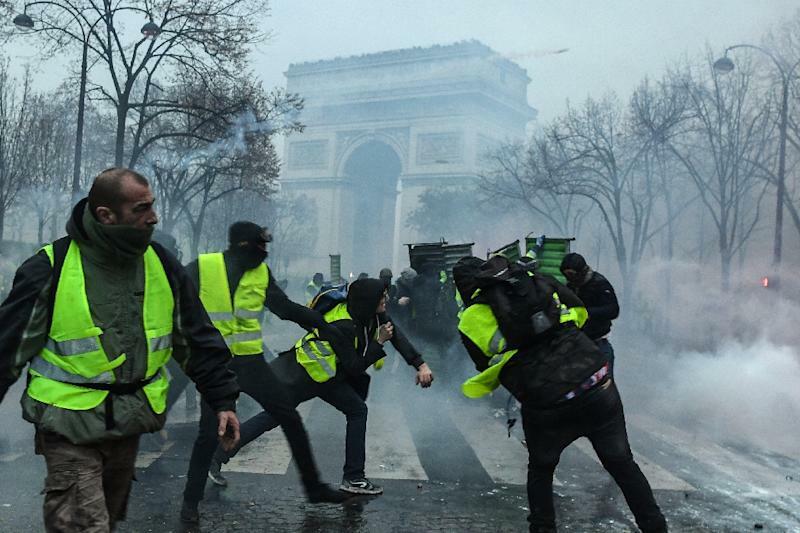 Paris (AFP) - The French government has announced a major U-turn in suspending fuel tax rises in a bid to end increasingly violent demonstrations. But who are the "yellow vest" protesters, and will the tax relief and other concessions be enough to mollify their anger? The "gilets jaunes" (yellow vests) movement sprang up in late October against increases in fuel taxes announced as part of President Emmanuel Macron's efforts to pursue clean energy policies. Donning the luminous safety vests French drivers must carry in their cars, the protesters have blocked roads and petrol depots for more than a fortnight, playing havoc with traffic in the run-up to the Christmas holidays. And in Paris, more than 200 cars were torched during protests last weekend that degenerated into the worst street clashes in the city centre in decades. While the protests began over fuel taxes, they have snowballed into a wider movement against Macron, largely among people in small-town and rural France. The protesters see the former investment banker as an arrogant "president of the rich" who is out of touch with the struggles of ordinary people in the provinces. Yet different protesters have different aims: Some remain focused on lowering fuel taxes, while others want Macron to resign. Many also want to reverse tax cuts that Macron introduced for France's wealthiest in a bid to boost investment. Underpinning the movement is a widespread complaint that overlooked provincial workers on modest incomes barely scrape by after paying some of the highest tax bills in Europe. An apolitical movement with members who vote for parties of various stripes, the "yellow vests" have won support from everyone from far-right leader Marine Le Pen to far-left firebrand Jean-Luc Melenchon. Prime Minister Edouard Philippe on Tuesday announced a series of measures aimed at quelling the anger. Planned increases in fuel taxes will be suspended for six months, as will stricter pollution tests on cars aimed at encouraging drivers to shift to cleaner vehicles. Increases in electricity and gas prices will also be frozen during the winter. A 500-million-euro ($570 million) relief package for poorer households had earlier failed to stave off the protests. Tuesday's climbdown represents a major departure for a president who had vowed, unlike previous French leaders, not to be forced into changing course by large street movements. Some protesters signalled they were satisfied with the government climbdown, including a group who said they would lift their blockade of a petrol depot in Brest, in Brittany. But another group blocking a petrol depot in Le Mans, western France, said they would press on. Marc Beaulaton, a retired 59-year-old nuclear safety worker, dismissed the government's offerings as "mini-measures". "The government is trying to put us to sleep," said Lionel Rambeaux, a 41-year-old welder. The movement has swollen by amassing people who are angry at Macron for various reasons -- but this also makes it harder for protesters to agree on their aims. "The dynamic of the movement is such that it's not certain the government's measures can stop it," said Jerome Sainte-Marie, head of the PollingVox polling agency. "What's more likely is that these measures divide the movement." Jerome Fourquet, an analyst at pollsters IFOP, predicted many protesters would suspect the government of trying to pacify them now only to bring back the taxes later. "Significant as they are, these announcements come relatively late," he said. "They may have had a different effect if they'd been announced a week ago." Emerging without leaders via social media, the "yellow vests" have tried to become more organised, nominating an eight-person delegation to negotiate with the government. But some members have refused to recognise the representatives chosen in a Facebook ballot, and the government has found it difficult to negotiate with the grassroots movement. A group of moderate protesters had been due to meet with officials at Philippe's office on Monday but pulled out, saying they had received threats from "anarchist kids" for agreeing to the meeting.